Race Status Report For MIROCK FBG Spring Nationals – There is only a 30% – 50% chance of a passing overnight shower on Saturday Night for Southern Maryland. 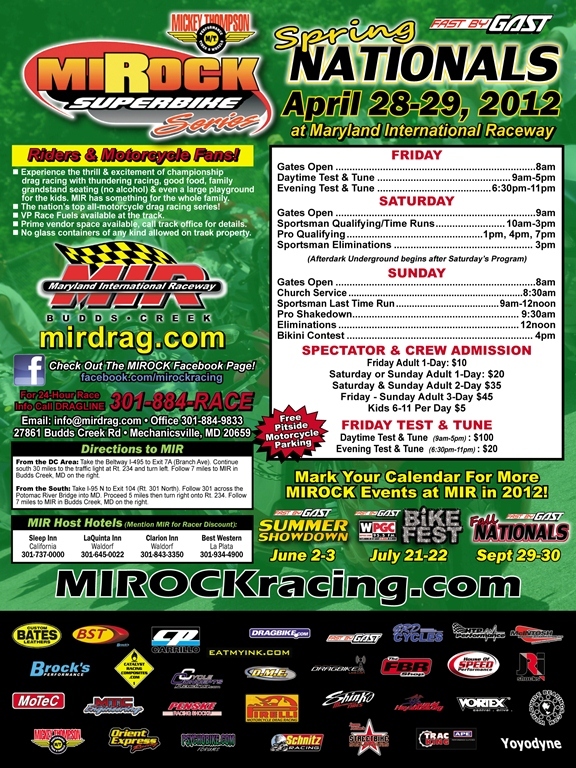 The Mickey Thompson Tires MIROCK Superbike Series is headed to Maryland International Raceway for the first MIROCK event of the year in Maryland at the Fast by Gast Spring Nationals on April 28-29, 2012. The event will feature Mickey Thompson Pro Mod, Orient Express Pro Street, DME Racing Real Street, Trac King Clutches Top Sportsman, House of Speed Crazy 8’s, FBR Shop 5.60 Index, Fast by Gast Pro E.T., and Brock’s Performance Street E.T. The event will also include Grudge Racing both days, and the “Afterdark Underground” 2-hour grudge program on Saturday night. The event will also host a huge vendor midway on both days full of motorcycle parts, apparel, and accessories! In addition to the racing MIR will host a $1,200 bikini contest on Sunday. So head to Maryland International Raceway for an exciting weekend of motorcycle action!